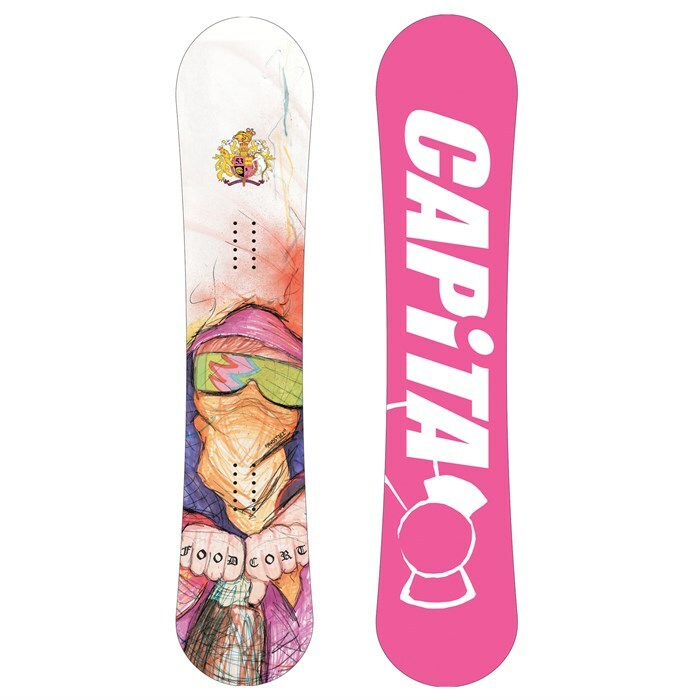 CAPiTA Food Court Gangsta Snowboard 2009: New for 2009, this is the CAPiTA FCG series which rose out of the 2007 MHT chassis—like Darwinian evolution, Capita products are evolving to higher and higher performance. This is a pipe board that goes big with a directional twin shape designed to be forgiving yet powerful in all conditions. The FCG cuts like a hot dagger through a dragon, this is serious smooth for long carves and floats like a feather in pow. When the FCG is in its home territory of the pipe, you can be sure it shreds like few others can. If you’re looking for an awesome pipe board with insane capabilities in other terrain, the CAPiTA FCG is what you need in your quiver. In fact, the FCG just might make you quiver. SS SELECT Core: The SS Select is a lightweight, vertically laminated poplar core with long grain orientation. For performance reliability there are no irregularities or finger joints allowing for consistent flex throughout the deck. FORM 6-C Fiberglass Configuration: The Form 6 is laid up wet by hand during the lamination process and consists of the highest quality stitched biaxial fiberglass placed on both the base and top side of the construction at 0 and 90 degree angles and added carbon stringers to further increase torsional rigidity and response. CFS Carbon Fiber Reinforcements: Carbons Fiber Strips along the rails to increase longitudinal stiffness increasing board response and energy. HTP Extruded Base: The High Transparent Extruded base features an altered molecular composition resulting in a faster, more durable base while maintaining the low maintenance benefits of extrusion.